Beautiful, newly renovated, oceanfront condominium set amid towering fir trees provides tranquility and privacy. 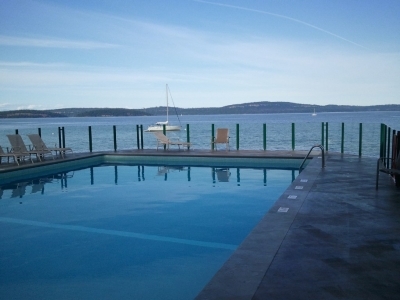 Located overlooking the Strait of Georgia in the picturesque area of Yellow Point, British Columbia. Just a 20 minute drive south of Nanaimo and only 90 minutes north of Victoria, you arrive in paradise. Nature at your door with breathtaking ocean views. The condominium can be rented as a hotel unit, a one or two bedroom, two bathroom suite. The hotel unit is equipped with a queen size bed, television, VCR, refrigerator, coffee maker, and small deck. It has a separate entrance but can be combined with the upper level to form a two bedroom, two bathroom suite. The upper level contains a full kitchen with deck, dining room, living room with pull-out queen sofa, and separate bedroom with twin beds which convert to a king. Second bedroom twin beds convert to a king. Telephone and fax machine available. Above rates are based on one bedroom for Fall/Spring based on two people. Add $50 per night and $200 per week (two bedroom in low season). Add $300 per month for the two bedroom condo in low season.